Vegan Eats and Treats! : MoFo Noshtalgia: Make 12 Banana Pops! 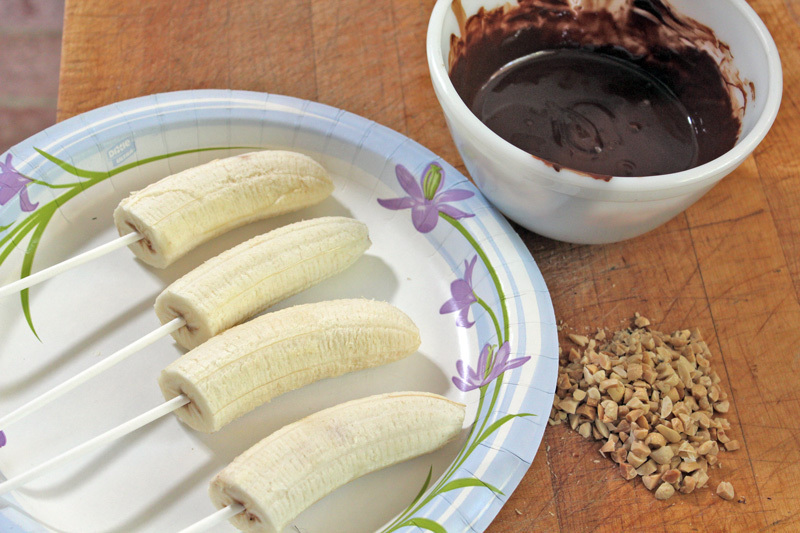 MoFo Noshtalgia: Make 12 Banana Pops! 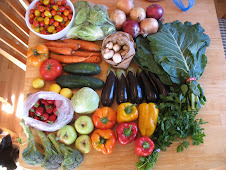 ~ posts that celebrate special summery memories. 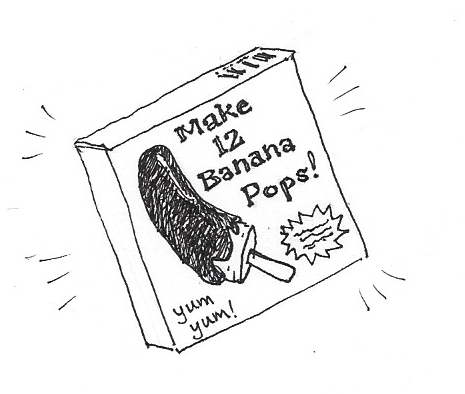 Back when I was a little twerp, in the early 80's, there was a product called "Make 12 Banana Pops." At least that's how I remember it. I looked online and was surprised that I couldn't find any mention of it. As I recall, it was a bright yellow square box with a super-cool 80's font that said in big 80's-style letters "Make 12 Banana Pops." There wasn't any other brand name or anything on the box, so it was just called "Make 12 Banana Pops." Inside were 12 popsicle sticks and a foil pouch with chocolate sauce in it. 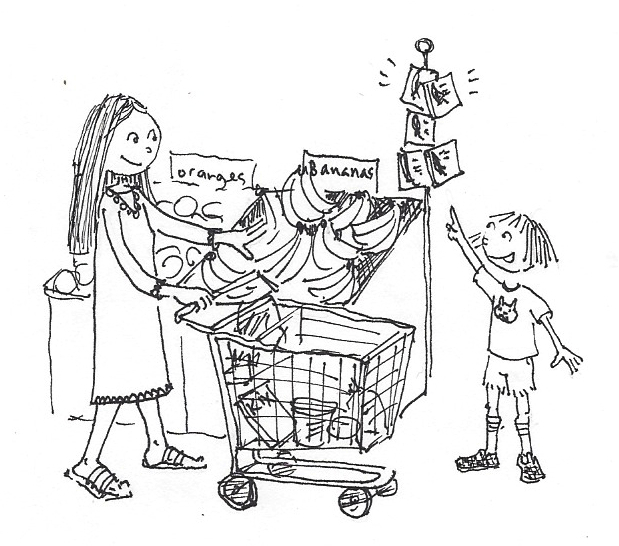 The packages were always situated right near the actual bananas. Now that I am a grown-up, I can see how clever this was. I remember seeing those bright yellow boxes and asking my mom if we could please make 12 banana pops today? Every once in a while, she would buy a packet of "M12BP" and it was great fun. Of course it was partly fun because we got a tasty treat out of the whole deal, but it was also fun because it involved actually making the banana pops as activity with my mom and brother. Together, my brother and I would get to make the pops: First, we would cut the bananas in half and put in some popsicle sticks. This was the hardest part, because you had to wait for the bananas to become frozen. It turns out that these days it is practically impossible to find old-fashioned popsicle sticks, so I had to use these new-fangled Martha-Stewart type sticks. I'm sure it would be more photo-chic to put your bananas on some parchment paper, but we always used a paper plate, and I am going for the full noshtalgic experience. As you can see, I did something non-traditional (gasp!) and added some chopped up roasted peanuts to some of them. Obviously, I also only made 4 banana pops, because frankly, that's enough banana pops for us these days. As soon as I had dipped my banana pops, I put three back into the freezer and bit right into the last one. So good! What a truly noshtalgic flavor blast from the past. Who even knows the last time I had a chocolate coated frozen banana? It was fantastic. 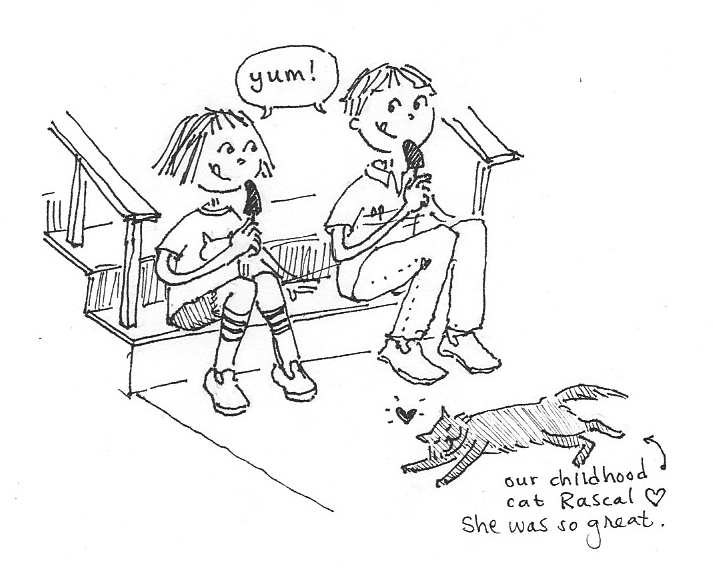 It took me right back to the olden days of sitting on the front steps with my brother, eating our banana pops. To my surprise, drawing this doodle brought tears to my eyes. Isn't it amazing how such simple, "meaningless" memories can be so evocative of days-gone-by? I love these! I am such a banana fan, and so is my boyfriend. When we first met, he told me that he worked at a frozen banana stand selling bananas coated in chocolate and nuts much like these. It was a lie, but an endearing one - it certainly had me sold. We used to make these when I was growing up, I'd forgotten all about them I'll have to make some for the girls, love the roasted nut addition! I still see these next to the bananas in big-box grocery stores! Your vegan version looks so yummy. I remember those boxes! They had candy apple ones too near the apples. I will have to make these with kiddo! Thanks for the reminder! I remember those too, and the candy apple packs. Looks yummy! I think I'll have to try that myself. Awww, so charming! I want to make 12 banana pops! 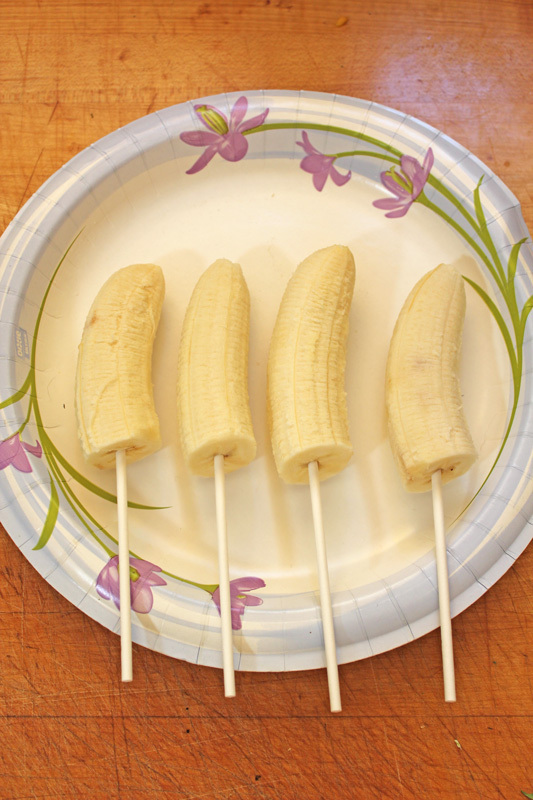 [ Smiles ] Unfortunately, I have never had banana pops in my life. However, 12 banana pops would not be enough for me; I would rather eat 24 of those! I remember those!!! Thanks for transporting me back to the 80's! Sadly, I never got to try them. Now I can! What a great idea! I think I'm going to try these. When I was a kid we used to freeze cordial in plastic cups and stick a lolly stick in. They were called Jubblies. If we were feeling extra special we used to put a polo mint in the bottom of the cup. Happy memories! 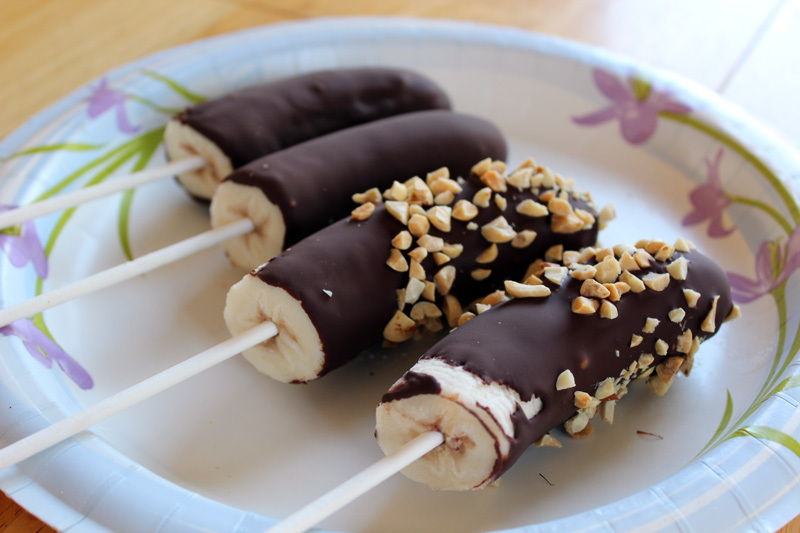 The sell chocolate covered frozen bananas in some places, but tragically they are never vegan because of the chocolate they use. Sounds like it is pretty easy to make your own, and with summer coming I might just do that. Man. SO good. My favorite popsicle growing up was a weird blue foot thing from the ice cream man. It had bubble gum balls for toenails. lol. Haven't thought about that for a long time. Thanks for the reminder, and I will certainly make a few banana pops, now.